A lot of people are coming to this blog in search of information on Albert Kahn, following the BBC4 series The Wonderful World of Albert Kahn. The Kahn collection is best known for its still photographs, which largely lie outside the concerns of The Bioscope, but he did employ motion picture cameramen too (as well as acquiring film from other collections), so here’s a short account of his Archives de la Planète, and some pointers on where to find out more. Albert Kahn was a millionaire Parisian banker and philanthropist who decided to use his fortune to document the world in photographs. Between 1908 and 1931 he sent out still photographers and motion picture cameramen to create a photographic record of the globe. The project was supervised by geographer Jean Brunhes, who employed around eleven cameramen who visited forty-eight countries and brought back 72,000 Autochrome colour plates, 4,000 steroscopic views, and 600,000 feet of film. They also acquired film from commercial companies, including newsreels and scientific films. Kahn called the project the Archives de la Planète. Kahn lost his money in the Depression, bringing an end to the project, but the collection survived. It has remained remarkably little known, particularly the film component, but a steady trickle of academic interest in recent years has now been followed by the success of the BBC4 series, which has rightly startled people with the beauty of the images and the sheer extent of what they recorded. Most of the film collection is in the form of unedited rushes of actuality subjects: everything from film taken in Mongolia in 1912-13, to the signing of the Briand-Kellogg Pact in 1928, A.J. Balfour visiting Zionist colonies in Palestine in 1925, fisheries in Newfoundland in 1922, and dancers in Cambodia in 1921. Kahn’s cameramen included Stephane Passet, Lucien Le Saint, Léon Busy, Frédéric Gadmer, Camille Sauvageot and Roger Dumas. There is an informative and thoughtful article by Teresa Castro, ‘Les Archives de la Planète: A cinematographic atlas’, which is a good place to start, and has some beautiful Autochrome illustrations. The Museum is located in the Paris suburb of Boulogne-Billancourt, and is renowned for its beautiful gardens. There is a plain official web page describing these, but you are better off reading the evocative New York Times article, ‘Philosophy in Bloom’, by Jacqueline McGrath, which describes a visit to the gardens (which are apparently not to easy to find). If you are entranced by Autochromes, there are several good sites to visit. This year (2007) sees the centenary of the Autochrome, recognised by www.autochrome.com [link now dead]. The highly recommended Luminous Lint photography site has an explanation of the ingenious Autochrome photographic process, involving the use of dyed potato starch grains acting as colour filters, which helped give them their particular ‘impressionist’ effect. 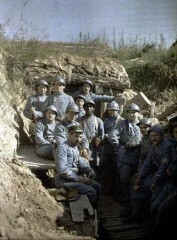 The site World War I Color Photos has some astonishing images from a conflict we generally only imagine in monochrome. Australian and French First World War Autochromes are reproduced on the Captured in Colour site (which also displays the Paget plate colour system). And there are more First World War Autochromes on the Heritage of the Great War site (though do note this site mixes these up with other coloured images, including artifically-coloured postcards). The Library of Congress has a page on the restoration of Autochromes. There is an exhibition of the expressive Autochrome work of Gabriel Veyre at www.gabrielveyre-collection.org (Veyre did not work for Kahn but was previously a film cameraman with the Lumière brothers, inventors of the Autochrome). George Eastman House has an online exhibit of eighty Autochromes from the Charles Zoller collection, reproduced in high resolution. The Galerie-Photo site has an exhibition of Autochromes (originally stereoscopic i.e. 3D), with some interesting technical observations. American academic Paula Amad has written “Cinema’s ‘sanctuary’: From pre-documentary to documentary film in Albert Kahn’s Archives de la Planète (1908-1931)” for the journal Film History, the best single source for information on Kahn’s project, and is writing a book on the collection. The site www.autochrome.org [link now dead] doesn’t have that much information, but it does tell you in detail how to make your own Autochromes the original way (it’s not easy). If you don’t want to try the original potato starch method, why not use Photoshop? PhotoshopSupport.com will show you how. 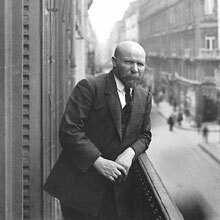 Pioneering scientific filmmaker Dr Jean Comandon was one of those who worked for Kahn, late on in the project, as the Institut Pasteur explains (in French). Definitely the book on Autochromes to buy is John Wood’s The Art of the Autochrome. There will be no more beautiful title on your bookshelves. Lastly, look out for the National Media Museum’s forthcoming exhibition The Dawn of Colour: Celebrating the Centenary of the Autochrome, which opens on May 25th. Update (April 2008): The BBC has now produced an Albert Kahn website, www.albertkahn.co.uk, which has information on Kahn, the autochromes and the Albert Kahn museum, as well as promoting the new BBC book The Wonderful World of Albert Kahn: Colour Photographs from a Lost Age. No plans have been announced for a DVD release of the BBC series, presumably owing to licensing issues. However, the Kahn museum section of the new BBC site refers to some DVDs, without going into further details. It has been rumoured that the museum was planning to produce some DVDs of its own, showcasing its Autochrome colour photographs (and its films?). This may be a reference to these, which do not seem to have been published as yet. Another update (March 2009): There are faint rumours of a possible DVD release, in some form. However, the original The Wonderful World of Albert Kahn series is now available on DVD from the BBC, but only from its educational service, BBC Active, where it is priced at an eye-watering £1,125 for 9x50mins DVDs – the intended market is institutions only. This existence (and price) of this would suggest that any subsequent commercial release to the public will be highlights in some form. And another update (September 2009): There is now a proper website for the Musée Albert Kahn, at www.albert-kahn.fr. It’s all in French, but includes several examples of the autochromes, photographs of the museum and gardens, a biography of Kahn, and news of exhibitions etc. Good news – the BBC has brought out the series on DVD. The Wonderful World of Albert Kahn is a 3-disc set (PAL, region 2), divided into nine parts, running 462mins. It’s released by 2 entertain, which is part-owned by BBC Worldwide. Thank you so much for those links. I too have been on the search for Kahn since that BBC series and was disappointed to see there was no real internet gallery of his images. I literally watched the programme with a dropped jaw – the photos are stunning and really bring to life a period that was always locked in black and white. What an unbelievable treasure trove! I hope one day there will be a full internet gallery so that we can look at the collection anytime we want. But in the meantime, thanks for those related links. Happy to oblige. It’s such a pleasure to see all the interest in Albert Kahn’s Archives de la Planete, a collection scarcely known by any but a handful of scholars until now, and the particular interest in Autochromes. The BBC has done marvellously well with its “Lost World of…” concept – Mitchell and Kenyon, Friese-Greene, and now Albert Kahn. It’s demonstrating how early actuality film collections, previously considered to be of interest only to the select few, have considerable popular appeal when the images are given space to soeak for themselves. It’s all about touching the right historical chord, amazing us with a view of the past that seems lost and yet so immediate. It’s the centenary of the Autochrome, though not the centenary of colour photography (it’s a long story…). But it’s been rather overlooked that last year saw the centenary of motion picture colour (or not, depending of how you define things). There will be more on Kinemacolor and other colour systems of the silent era in future posts. Oops, correction needed. The BBC4 series is The Wonderful World of Albert Kahn, not the Lost World of… It was originally going to be called The Lost World of… (you can still find it under that title on IMDB), but clearly someone decided somewhere down the line that it was better to express wonder rather than loss. Odd. The Wonderful World of Albert Kahn is a revelation. How did he get so many wonderful photographers working with him to produce such painterly photographs. Fantastic stuff. Looked around the internet for photographic books of all this work – little has been produced. Is there any chance of getting BBC4 to produce a DVD? There would be a lot of buyers out there, includingme! I haven’t heard tale of a DVD release, though given what happened re the Mitchell and Kenyon and Friese-Greene series, it must be a possibility. It may depend on whether the series gets a BBC2 screening as well, which would up the public profile. The question how he got such wonderful photographers to work for him is easy – it was a well-managed project with a strong central manager, and Kahn was rich. The painterly quality of the Autochromes comes in part from the nature of the process, as outlined in my post, and the length of exposure. Owing to the light-filtering nature of the process, it took about thirty times as long to take an Autochrome as a conventional photographic plater of the period. In good sunlight, the photographer required an exposure of a second; ten seconds if it was cloudy; in a studio it could be up to thirty seconds. All of which encouraged static subjects and particular attention paid to composition. Finally, the photographers were often consciously imitating painterly style. Thanks very much for these links – I’m another person who’s found you after watching the whole BBC4 series with my jaw on the floor. I wish there was a book of the autochromes from Kahn’s project available – in the meantime, I think I feel a trip to Paris coming on! There’s been a lot of fabulous material coming out of the BBC4 Edwardians season, and I hope that some of the programmes (this series and the surprisingly and wonderfully moving adaptation of The Diary of a Nobody in particular) make their way onto BBC 2 for a wider viewing. Lots of Autochromes on the exhibition site, and there’s a book of the exhibition as well. One oddity about the BBC4 Edwardians season – nothing on the film industry. Film was invented by the Victorians, but the Edwardians invented cinema. It’s an odd lapse (actually, I was approached by a TV company looking for ideas to put the commissioning editors for the series, and they said the feeling was that after Mitchell and Kenyon early film had been done more than enough and they would be looking for other subjects). I too would LOVE to own a high-quality book featuring Albert Kahn’s photographs. I’m surprised they have not alreadly been published – perhaps his heirs don’t want this to happen? The images were absolutely stunning and remain engraved in my memory. Each photograph seems to be a work of art, and the work is an absolutely marvellous record of people whose cultures have all but vanished. The work clearly showed how diverse the people’s of the world were before the advent of worldwide communications – the pictures from China and the Balkans were particularly amazing for me (although I missed some of the programmes).I t’s a record that should be made easily accessible to people living in the world today. Is there any chance of a DVD? Could the BBC show the programmes on BBC1 or BBC2 at a somewhat later time, when people are home from work? The BBC isn’t letting on about any DVD plans, or broadcasts on BBC2 (or BBC1). I’d have thought a BBC2 showing would be very likely, while any DVD plans will depend on licensing arrangement with the Kahn museum – and how well it does on BBC2 (have there been many DVDs of programmes which have just been shown on BBC4? I don’t think so). I’ll keep my eye out for any news. But do note that they have made nine programmes – five are showing in the Edwardians season; another four on the 1920s will be shown later in the year. The Science Museum and the National Media Museum in Bradford are both part of the same group of museums, which come under the umbrella of the National Museum of Science and Industry (NMSI). The Science & Society Picture Library markets images from NMSI collections, and hence has a number of Autochromes on show, reproductions of which can be ordered from the site. I am so annoyed that the BBC will not make dvds of these wonderful programmes. it is a crime that so few can watch these programmes. they’re broadcast once and that is it. does anyone know if i can purchase them from the bbc archive? It is not that the BBC won’t make DVDs but that they can’t. As I understand it, the Albert Kahn museum licensed the Autochrome images and films in its care for use in the programmes, but not for any further commercial use. For the same reason, the BBC Archive cannot make copies for individuals (which is not a service that it generally provides in any case). There are rumours that the Albert Kahn museum will be issuing DVDs of its own, in 2008, but these will not be the programmes as broadcast. I had a very very small part to play in helping the bbc with their location shoot at Carbis Bay. Albert Kahn lived at Trencrom Villa for some years which was later demolished and the new Carbis Beach Apartments were built. There is a little information about this part of Carbis Bay’s history. I have seen some of the photographs from the inside of Trencrom Villa but have never found them on the internet. Could you tell me if there is any archive. We are looking to document the history of Carbis Bay in more detail and are working with the St Ives Archive Trust. Some old postcard images showing Trencrom Villa can be found on http://www.carbisbayholidays.co.uk/html/carbis_bay_postcards.html . There is no online archive of the Albert Kahn collection. The nearest there is to a website is a one page general description of the Albert Kahn museum here. The museum houses all of the Autochromes and films shown in the programmes. As I understand it, a small number are on display, usually in the form of themed exhibitions. For the rest, it will be necessay to write to the museum and explain your interest to them. I would welcome the opportunity for my company CreateOnline Limited to use any or all of these marvellous photographs to provide an on-line print-on-demand service to allow people to buy prints of them. How could I track down the image files and pay royalties to copyright holders? All of the images are owned outright by the Musée Albert Kahn. You would need to ask them. The BBC is publishing a book, “The Wonderful World of Albert Kahn”, which one hopes will contain some good reproductions of autochromes. At £35, it should. To be published 03 Apr 2008. Nice to see it going out on BBC2. More accessible. Excellent news. I’ll post something on it now – it’s listed on Amazon. I too was mesmerised by the programmes, two of which I managed to record. Has anyone else done so? If they have, is it possible to get a copy done, or is this in breach of copyright? Delighted to hear there will be a book. Making copies for other people is most certainly a breach of copyright. I list all the cameramen I know of as part of the post. It’s not a comprehensive list, though. What was your grandfather’s name? If it was Gobbett, presumably he was Thomas James Gobbett (or else his brother, who I think was also in the film business) of the Precision Film Company, which was a British company in the early 1900s. No British cameramen worked for Kahn. I’ll contact you away from the blog to see if I can help any further. There is now an Albert Kahn website, featuring photographs from the BBC book. You can view it at http://www.albertkahn.co.uk. Terrific news – thank you for letting me know. I’ll add an update to this site. A quick comment from Albert-Kahn Museum in France. And you are most welcome next time you will have the opportunity to come to France. The museum is easy to reach through subway, terminus of the line 10, station Boulogne – Pont-de-Saint-Cloud. You will visit wonderful historical gardens and photographic exhibition (we shall be closed between 22nd of Dec. till 2nd of Jan. and we are closed on Mondays). A great exibition about India (with 150 picutres) is open until summer 2009. They are beautiful images. Somehow they are all the more beautiful for having the small imperfections that demonstrate that you have gone back to the original processes, which I see you describe on your site. I hope you are able to publish more. I foressee more images to be posted each month, maybe more often if I am productive enough. Why is the public being prevented from seeing this series on DVD at a reasonable price? I just missed an episode I wanted dearly to see, (Turkey/Istanbul) but found out hours after it screened on SBS (Australia) that it was on. My family had to leave Turkey in 1922 and the images of that era are priceless to me. I am happy to buy the series on DVD, but not for £1,125! What is the twisted logic that you can watch it free on TV if you are aware that it is on, but otherwise it’s totally unaffordable. And it’s not on YouTube. Somebody from Albert Khan’s estate tell me how this philanthropic visionary would feel about the difficulty we have in seeing his images when he was driven by a desire to bring the far flung corners of the world into the reach of everyone. The ‘twisted logic’ is simply the licensing deals which have been signed, and which the BBC (or BBC Worldwide, its trading arm) is obliged to honour. But what you say about what Albert Kahn’s view would probably be I can only agree with wholeheartedly. Good news for one and all – The Wonderful World of Albert Kahn has now been released on DVD in the UK, through the BBC’s 2 entertain label. It’s in nine parts, running 462mins (some sources say ten parts, which seems to be an error). If you are visiting Paris, you should definitely go and visit the Albert Kahn museum. Right now there is a wonderful exhibition about Japan in the 1910-1920s. And also do not forget to visit the wonderful garden. The Japanese water garden is certainly the most beautiful (and accurate) you can ever see outside Japan. I really hope to get there one day.